Handmade Thanksgiving Dog bandana. Dress up your pup (or cat!) 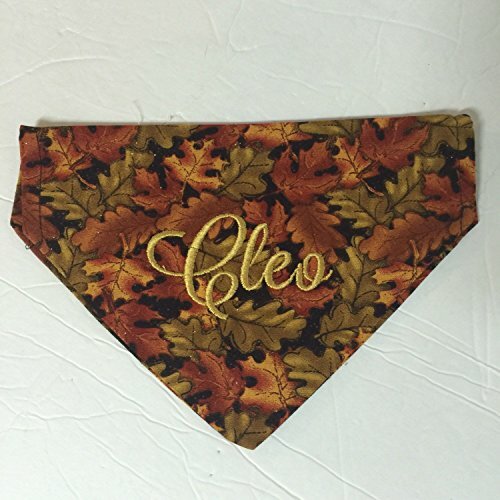 with this Personalized Fall Leaves dog bandana. Perfect for Dressing up for the Holidays! This reversible, slide on bandana is sure to show off your dog's personality! This particular bandana is reversible with Fall Leaves & your dog's name embroidered on one side & a coordinating pattern on the other. Available in 5 sizes, please select your pup's size from the drop-down chart. If you need a different size, I'll be happy to make something just for you! My model is Cleo, he's a 2 year old Basset mix & is wearing the size Medium. EXTRA SMALL BANDANA (Tea-cup sized dogs or cats) Finished size approx. 6" across x 5" long SMALL BANDANA ( Yorkie's, Jack Russel's) Finished size approx. 7" across x 5 1/2" long MEDIUM BANDANA (Beagle, Cocker Spaniel) Finished size approx 9" across x 6" long LARGE BANDANA (Labs, Bassett Hounds) Finished size approx 11" across x 7" long EXTRA LARGE BANDANA (Golden Retriever, Mastif) Finished size approx 15" across x 10" long These are just suggestions, since each dog is different, if you don't see your size, please send me a custom request. All bandanas are made from 100% cotton fabric, it is suggested to wash on delicate / cold and lay fat to dry. If you have any questions about this product by Sky Pixie Designs, contact us by completing and submitting the form below. If you are looking for a specif part number, please include it with your message. Dog Skin Spray. 100% Pure All Natural. Soothe & Calm Irritations - Hotspots - Bites - Allergies - Razer Rash - Flaky skin flare ups. Hypoallergenic. No mess, handy and easy to use.